So we’re gonna kick things off at the print shop with a photo I shot earlier this year. In June, the Heartbreakers ventured across the pond for their first tour of Europe in more than 20 years, the highlight of which for me was two nights at the legendary Royal Albert Hall in London. The concerts were on a Monday and Wednesday, but the crew had to load out in between the two shows because the Dalai Lama was slated to speak at the venue on the off day. His Holiness was scheduled to load out by 3 AM after his gig, so I figured my only shot to photograph the room completely empty was before our crew was scheduled to start loading back in at 5 AM. After grabbing a very necessary cup of coffee in the hotel lobby, I made the early-morning walk over through Kensington Gardens, showing up at the stage door just before 4:30 AM. Wandering into the empty hall, I was immediately struck by two things – how quiet it was at that early-morning hour and how incredibly beautiful the place was. It’s truly one of the great jewels of the world. I shot a load of photos both inside and outside the venue that morning, but I knew I wanted to work with this one soon after after I got it. There’s something about the regal feel of the room in this image: the reds and golds, the lavish filigree that adorns nearly every inch of the space and the gigantic pipe organ in all its splendid glory that anchors the background. I was a bit bummed to discover after the fact that I didn’t get a single frame with the room totally empty; if you look closely, you can see a few workers in hardhats milling around onstage. Oh well. Next time. I’ve had quite a few people tell me that the photo reminds them of the line in The Beatles’ “A Day In the Life,” “Now they know how many holes it takes to fill the Albert Hall.” For a Beatles nut like me, I’ll take that any day of the week! So here’s the link where you can purchase a print of “The Albert, 5 AM.” All prints are unframed, hand-signed and numbered along a white border. 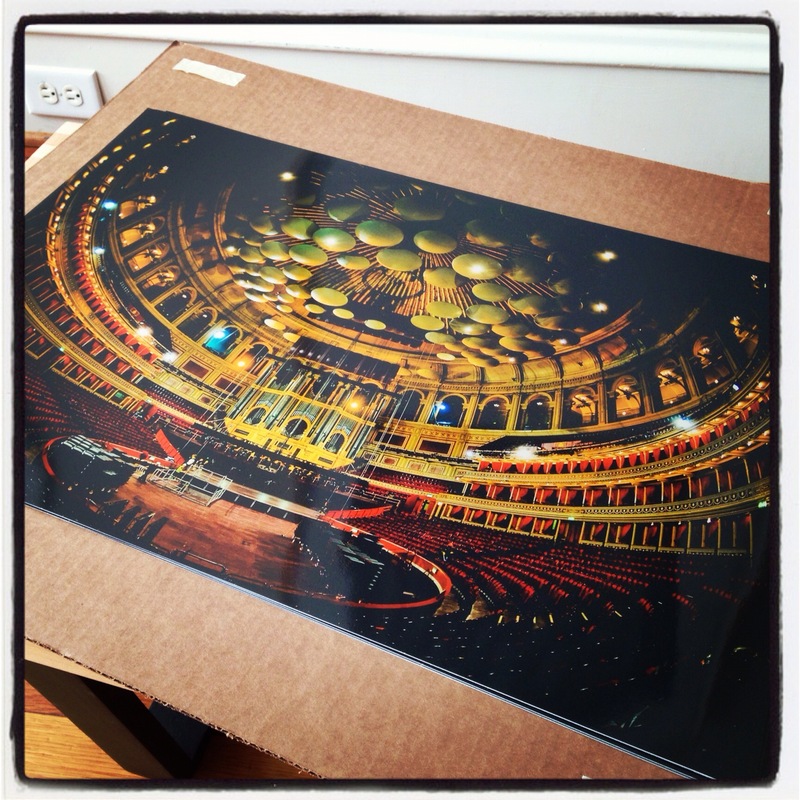 They’re printed on acid-free, high-quality Hahnemuhle Fine Art paper and guaranteed to last a lifetime if professionally framed behind archival glass. 100% of the proceeds from this auction are going to the American Red Cross to assist with the relief efforts in New York and New Jersey in the aftermath of Hurricane Sandy. Having spent a big chunk of my childhood living in the Tri-State area and with family still there, I felt the need to pitch in and help. 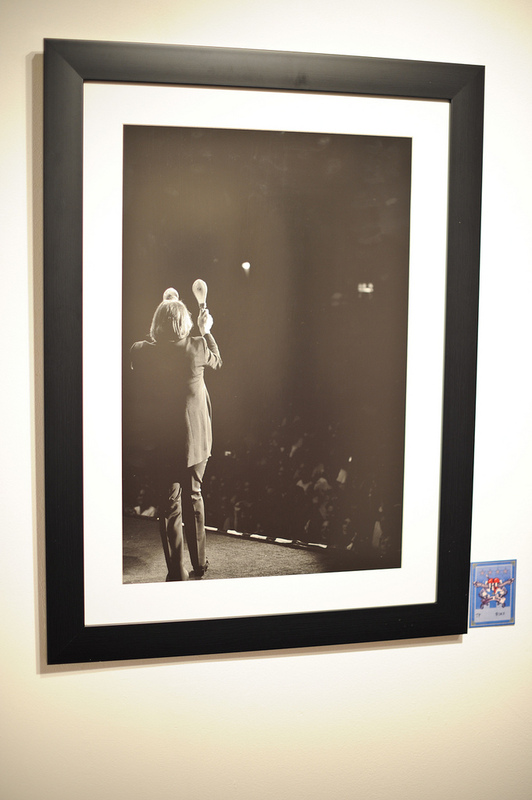 Bid on this one-of-a-kind print benefiting the American Red Cross’ Hurricane Sandy relief efforts here. 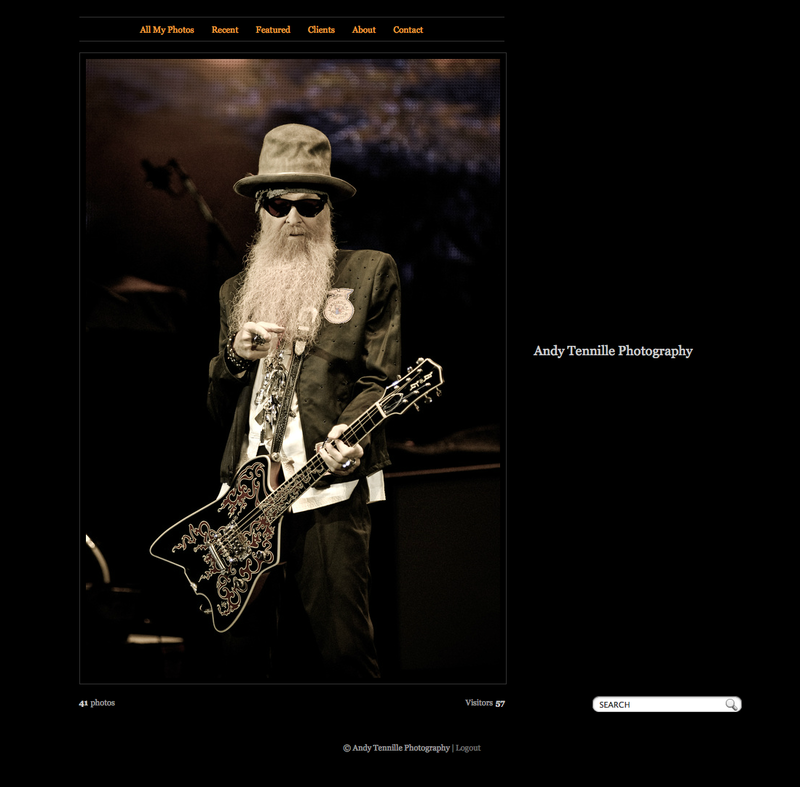 Very pleased to announce the launch of Andy Tennille Photography, my brand spanking new online spot to purchase prints of my photography. It’s a long time coming, for sure. Rather than upload huge galleries of images all at once, we’re gonna do ’em one at a time and share a story or two about each image as they’re posted. Make it a little more personal and allow me an opportunity to write some, which is something I’ve been wanting to do more of for a while now. Feel free to drop me a line or make a comment about any artists that you’d like to see. Be sure to check back often as I’ll be posting new photos every week and have a few special surprises on the horizon. 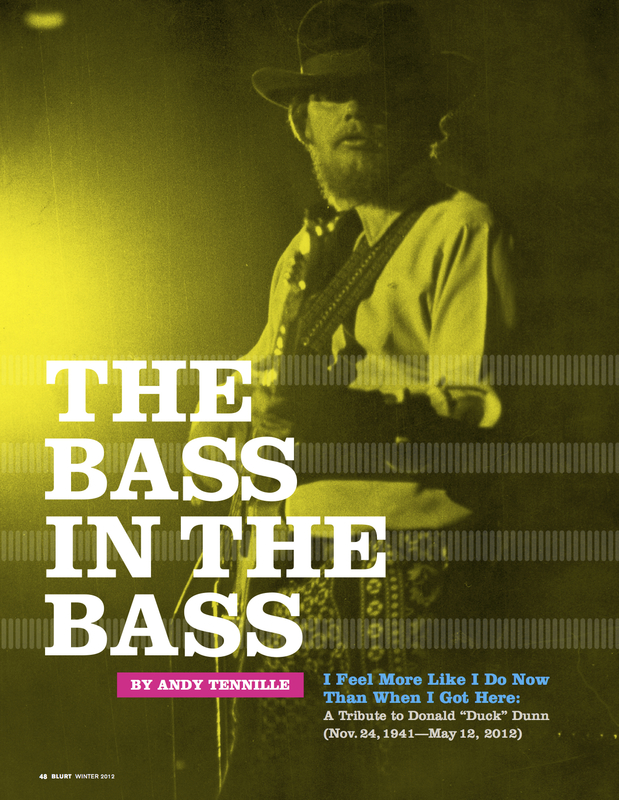 Very proud to share a tribute I did for the current issue of BLURT Magazine on Donald “Duck” Dunn, the legendary bass player for Booker T. & the MGs and Stax Records who passed away earlier this year. This piece was a lot of fun to work on. I originally sent out around 10 or so emails to various musicians, managers, publicists and friends to see who I might be able to drum up to speak with about Duck. I wanted to get a mix of Duck’s peers – his colleagues at Stax and other musicians of his era – as well as some younger musicians who were influenced by Duck’s playing and the music he made. The response I got was staggering. Nearly everyone I reached out to responded and, in some cases, folks were so eager to help that they put me in touch with other friends of Duck they thought I should speak with for the story. David Hood led me to Wayne Jackson. Jeff Dunn connected me with Brian Johnson. And then on the day I was due to hand in the article, the phone rang with a call from a number and area code I did not recognize. “Hello?” I said, picking the receiver off the cradle of my office phone. I still have no idea how Dan Akyroyd got my number, but the memories and thoughts he shared about Duck’s time in the Blues Brothers band are some of my favorites in the piece. You can download a PDF of the story here, but I’d be remiss if I didn’t encourage you to swing by your local newsstand and pick up a copy of BLURT. 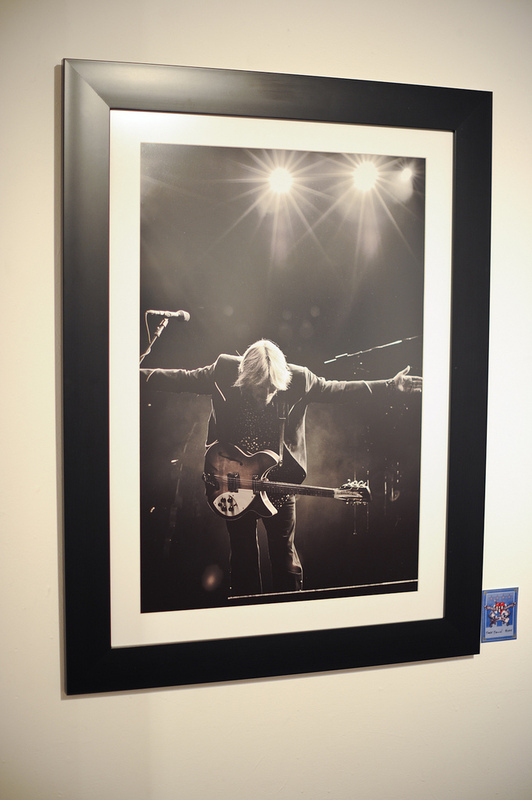 So the auctions for the 15 framed prints that I donated to the Tazzy Animal Rescue Fund from Tom Petty & the Heartbreakers’ 2010 Mojo tour wrapped up over the weekend on eBay. All told, they raised a little more than $4,725, which all goes to the good folks at Tazzy to help dogs of all kinds, shapes and sizes. Can’t thank everyone enough for your bids and help in getting the word out. Losing Jolene was really hard, but the response these auctions received – and the money they raised to help dogs in need – made us real proud. I’m sure a Brown Dog somewhere is really happy, too. 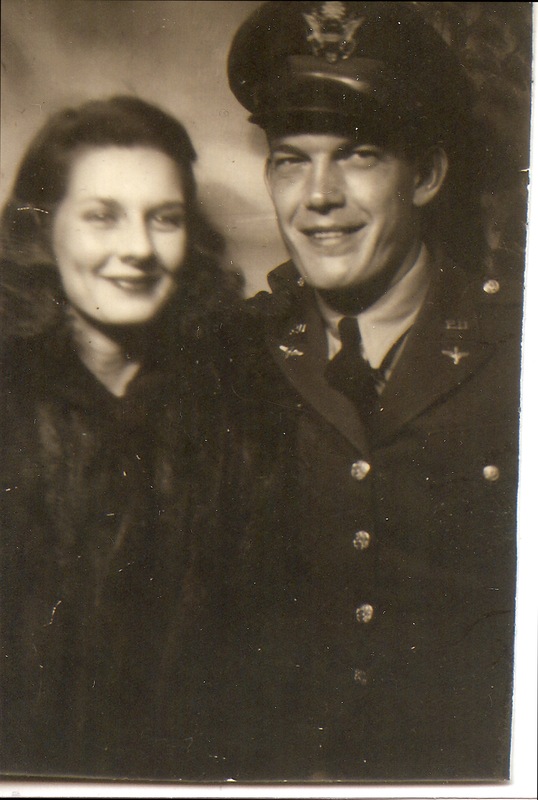 In honor of Veterans Day, I thought I’d post the story I wrote several years back on my grandfather, who flew B-25 Mitchells in the Pacific in World War II as a part of the 17th Tactical Reconnaissance Squadron of the the 5th Air Force. It was the last piece that ran under my byline at the Enterprise, my first job out of college. By the time it hit newsstands, I’d left the paper and was halfway across the country to San Francisco, where I’d live for the next seven years. It’s a huge PDF file, so it may take a bit to download. Read it here. Happy Veterans Day to all the men and women who have made the greatest sacrifice yesterday and today for the freedom we all enjoy! Thank you. 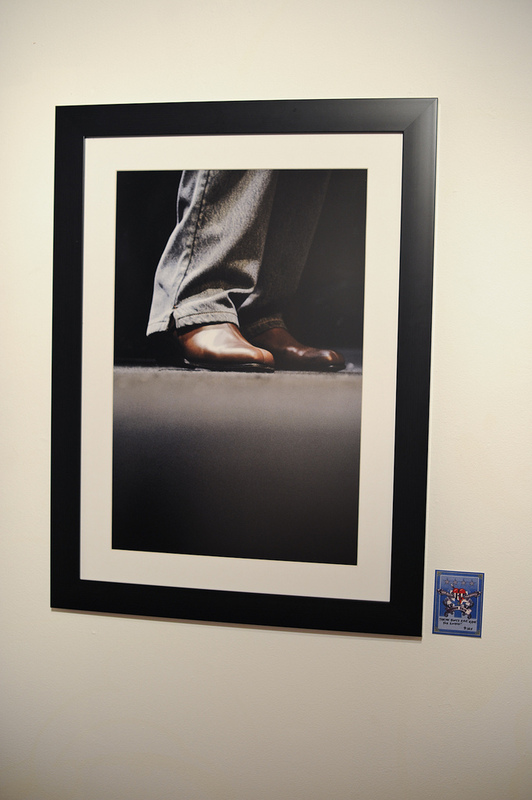 Danny Clinch is partly to blame for this image. Modelo tallboys may have also played a role. On a night off on the 2010 tour in Manhattan, I got invited to shoot the Black Keys at Summerstage in Central Park. The Keys were fantastic that night, totally on top of their game and just killing the songs off Brothers. Danny was also shooting that night, and after the show, a small group of folks headed over to his studio to drink some Modelo tallboys and shoot the bull. I think we maybe watched some of the Louisiana Fairytale footage and a few other things Danny had in the hopper. Modelos were consumed late into the evening, and at some point, we started talking about the Heartbreakers tour. “So how many shows have you shot so far?” Danny asked. “Twenty or so, I think,” I replied. “Have you gotten bored yet?” Danny asked. Two nights later in Philly, Tom walked onstage wearing these beauties, and I remembered what Danny had said. I got a bunch of great shots, including this one. A few months later, when I was editing the images, Nancy Sinatra’s “These Boots Are Made For Walkin’” popped up on my iTunes shuffle. The photo was named. Tip of the hat to both Danny and Nancy. Bid on These Boots Are Made For Rockin’ here. The auction on TP ends later today (nine hours, 25 minutes and 20 seconds, to be precise), so I figured I needed to post a little something about this image before it’s gone. TP might be my favorite piece in this auction. It was taken during “Oh Well”, the Fleetwood Mac tune that the Heartbreakers frequently cover on which Tom shakes the maracas. I’m pretty sure I took the shot peeking out from behind Mike Campbell’s amp stack, which was a frequent hiding spot for me onstage on the 2010 tour thanks to Chinner, Mike’s guitar tech. I played with this image a lot in post-production. In the raw file, the crowd is much more visible and present than they are in this print. There are versions of the image in color and black & white, different crops and different highlights/shadows. In the end, I liked the effect of Tom standing in a lone spotlight with his back to me, shaking the maracas and looking out into this abyss of darkness with glimpses of an audience in the foreground. When I got there, I felt like the image snapped into focus. That’s usually when I know to stop tinkering. © Andy Tennille, 2012. Unauthorized use and/or duplication of any material on Liner Note Junkie without express and written permission from this blog’s author and owner is strictly prohibited.